In recent years, there have been many new regulations relating to impervious versus pervious coverage passed, as well as rules relating to waste water management. These regulations control how much space you are allowed to cover with surfaces such as brick paving. The rules vary from each municipality and it is well advised to check on your particular zoning codes. Once established what you can legally do with your small space, you are ready to begin creating your dream outdoor living space blueprint. Embrace the backyard space you have and use the following tips to transition your small space to your own oasis. Laying out your narrow backyard or tiny yard and keeping it functional and beautiful is not an impossible task. There are endless small patio ideas and styles to choose. Each garden is unique and has its own style. What is your style? Does a formal landscape look appeal to you? Perhaps you are intrigued with a quaint country garden design look. 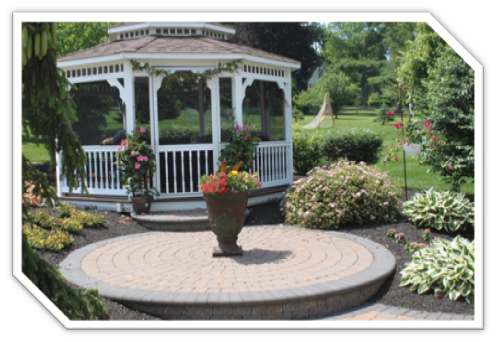 Maybe you always dreamed of a backyard with a classic country style that has a Pennsylvania Bluestone patio or your taste leans toward a Japanese inspired garden retreat. Whatever your landscape design style is, you can easily adapt it to a smaller yard setting with some advance planning and forethought. 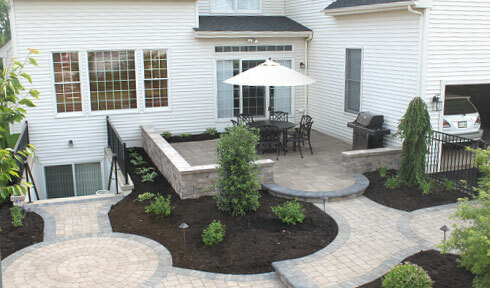 Dividing the backyard space into distinct zones creates unique destinations, thereby maximizing the entire yard space. Keep the small space very functional, by each outdoor living room or nook having its own purpose. For example, a small courtyard could be your outdoor sitting area with a fireplace and a separate area for unwinding in your hot tub. This configuration would allow you to fully use the outdoor space during the colder seasons. How do you want to spend your time in your small space? Do you want to cook, dine or entertain? Do the kids really like to play or maybe you need a peaceful spot to meditate? Dividing the garden up into different rooms will check some of the boxes on your wish list while working in a small footprint. Attract the eye upward by using vertical and overhead space. Incorporating some of the following elements is great use of vertical space: tiered planters, trellises that conceal and let light in, lattice planted with climbing vines. One of my favorite climbing vines is Mandevilla. 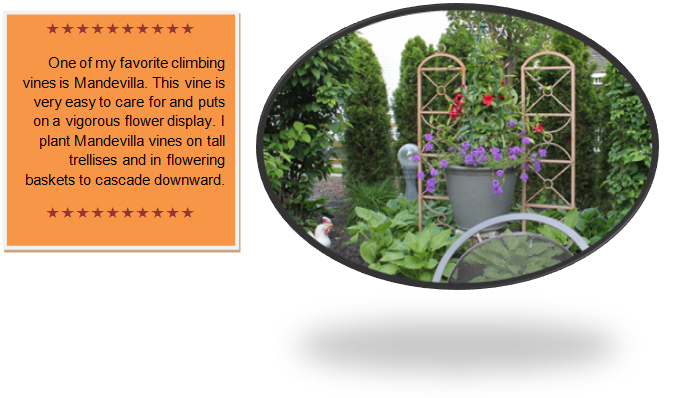 This vine is very easy to care for and puts on a vigorous flower display. I plant Mandevilla vines on tall trellises and in flowering baskets to cascade downward. A well positioned structure such as a pergola is a fabulous use of overhead space and adds dimension to a small area. Hanging flowering baskets draw attention to a particular spot you wish to highlight. I have flowering baskets that hang down from a tall bell pole to provide height in the space. Window baskets planted with colorful annuals add to the garden view and take no space. Create a focal point to attract attention such as a lighted water fountain, edible herbs and vegetables in containers or a stunning tall garden statue. The use of water and garden art are great additions as a centerpiece in any flower garden or small backyard plan. Plant a privacy screen to block unsightly views and distractions. You will joyously sip your morning coffee if you are secluded and do not have to interact with the neighbors constantly. Position the plants to make use of symmetry and balance while achieving great blockage, this will create a calming feeling. I recommend using Green Giant Arborvitaes for a property border screening. Green Giants grow fast are very hardy, plus deer resistant. Differentiate and contrast your space by incorporating varied shapes in the furniture or your patio shape – for instance, use both rectangular and circular shaped patios. Mix it up with a counterpoint for interest. Use something unexpected like a unique texture in the plants & flowers. Bright patterns on accent pillows and throws will provide contrast. Think fun filled décor for the kids with a brightly colored painted picnic table or an old wagon bursting with flower blooms. Character is key in your small space – outdoor furnishings are the final finishing touch; the icing on the cake. An attractive outdoor rattan sofa can be purchased cheaply at estate sales or craigslist to provide sophisticated character. Layer character into your space with these elements: a bold outdoor rug, whimsical outdoor art, illuminating lanterns for a cozy glow or a stately outdoor chandelier. 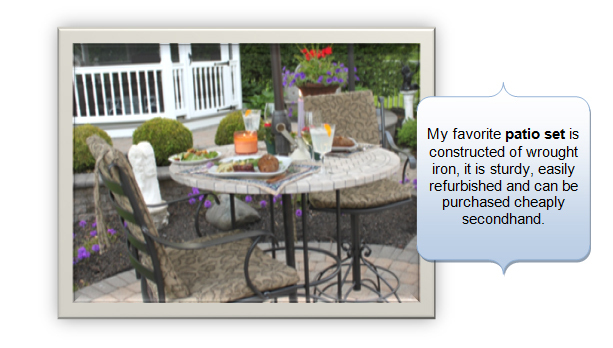 My favorite patio set is constructed of wrought iron, it is sturdy, easily refurbished and can be purchased cheaply secondhand. Spray paint is a wonderful thing. Patterned outdoor cushions and pillows can be added to give a custom look tailored to your taste. Have fun and enjoy your new small space! I absolutely love spending time in my gazebo listening to music and admiring my garden handiwork. It is my favorite part of my backyard and that is saying a lot considering I design and build patios for a living. In my opinion, gazebos are widely under used in the landscape and for outdoor living. Often a gazebo is over looked in favor of a screened porch. However, I truly feel there are real advantages of choosing a gazebo versus a screened porch. That is why our company helps our clients by offering custom backyard gazebos crafted with the finest workmanship and materials. Most gazebos come prefabricated, that means they are delivered to your property already built. These custom designed prefab gazebos are very durable and well constructed. Another advantage – gazebos that come prebuilt may only require a zoning permit, not a building permit which can help to keep your property taxes lower. Please note, individual municipalities vary check with yours for exact codes. Screened porches attached to the house always require building permits and thus, can raise your property taxes. A disadvantage to a backyard attached screened porch is it can block your light and view. One of the greatest advantages of a gazebo is the ability to place it wherever you decide. No need to block your inside sunny light, also you can position a gazebo to take advantage of great garden views. When relaxing in the gazebo, you are part of the garden – not looking at the garden . Additionally, gazebos come in many shapes: octagon, oblong, oval, square and rectangular, a screened porch is usually rectangular and attached to the back of house. Sit out in the evening in your new gazebo with candles aglow, enjoying the stars; but, not having to deal with the nuisances of bugs and rain drops. A fully screened gazebo including screening under the floor, really does keep out unwanted pests. Today’s gazebos can be ordered to look sleek, without the gingerbread if that’s not your style. Add an electrical package and install your flat screen TV to enjoy the big game outdoors. Gazebos can range in size from 8’ to 16’. All materials are customizable to your liking. Roofs came in asphalt, wood or metal. Roofs can be ordered in single height or double height with cupolas. Siding can be maintenance free vinyl or wood. 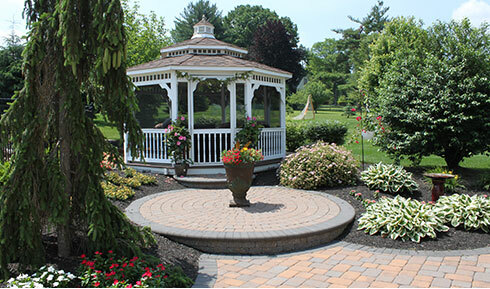 Think gazebo when you want that perfect addition and enhancement to your yard. Make your patio a social destination by pairing it with a screened gazebo from R&R Caddick Today. We can help with all your selections, customization and site prep and delivery. Contact R&R Caddick 215-491-0767 to get started. I generally am not that great at cooking; if I do not follow a recipe then the finished meal comes out looking like a bunch of jumbled ingredients lacking in flavorful taste. 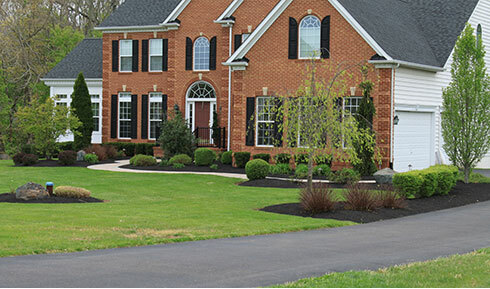 The secret recipe to beautiful landscapes is to follow a front yard landscaping plan. Consider these factors when drafting a simple front yard landscaping plan for maximum curb appeal. A well drafted plan will save you money by providing a guide to follow to shop wisely. Plan for year round interest. Garden designers know that as each season changes, so do the sun shade patterns. Use plants that are adapted to your yard’s conditions. Season long interest can be attained by including plants with variegated and colorful foliage. Think Japanese Red Maple tree or Gold Thread Cypress to name a few. Extreme shaded locations can present an extra challenge in the landscape. Hosta is a great shade understory perennial. Chose plantings adapted to your area’s hardiness zone. I incorporate evergreen shrubs in locations that have colder seasons, evergreen shrubs and trees provide interest when all the flowers and leaves are gone. I like to plant a greenery hedge such as boxwood under the house windows. Think long term – about mature planting size and plan for it, time passes quickly and beds will fill in fast. An overcrowded landscape is unappealing; allow room for your trees and shrubs to increase in size and value. Think of using plants that are low maintenance and hardy. We have all seen those stunning magazine pictures of beautiful blooming plants and many of my clients will request those in their front house landscape. However, it is best to use front yard plants that are disease and insect resistant varieties. You do not want to spend all your free time spraying toxic chemicals or replacing dead trees. Do your plant research and talk to your local nursery for best plant suggestions. Determine the look you want, chose your style or theme such as modern landscape or a natural style landscape. Landscaping ideas for the front of house can be obtained by looking at landscape pictures of the different landscape styles. I like raised beds formed with screened top soil to delineate the lawn area from the planting area. I usually make the edge on the raised beds curved; unless, we are installing a formal landscape theme that calls for angles. Bed edges are a great location to plant flowers in abundance with vibrant colors, use your evergreen hedges as a backdrop. Hillside landscaping is another opportunity to plant flowers in mass for color. The house and yard should work together in unity. One should not overpower the other. Scale can be achieved by using tall trees to impart a look of permanence. I recommend flowering ornamental trees such as Kwanzan Cherry Trees, the bark has great color and texture also. Pay attention to detail and don’t forget the driveway landscaping. Texture – Highlight special accent plantings with outdoor up lighting such as a Japanese Maple Tree. I really like planting Japanese Maple Trees; their leaves have a very fine texture. I find large boulders and rocks can introduce a course texture element as well. Another fantastic texture in the landscape to try is Ornamental Grasses; they are reasonably priced and add year round interest. There are many varieties with different colors and heights to experiment with in your design. Plant in mass – this idea works great for flowers to add color. Keep in mind many flowers beds will require extra watering and re-planting each year for annuals. Color should also be considered in the selection of trees and shrubbery. Purple Plum trees have deep crimson leaves. Don’t hodgepodge every plant variety form your local nursery together. Make it flow – achieve balance by repeating the same variety of plants and texture. Plant in odd multiples, usually plant in threes or fives. Plant in mass and repeat to give a sense of balance. Remember you can transform your simple front yard landscape from ordinary to extraordinary with a pre thought-out plan and a recipe of design elements to create a landscape masterpiece. 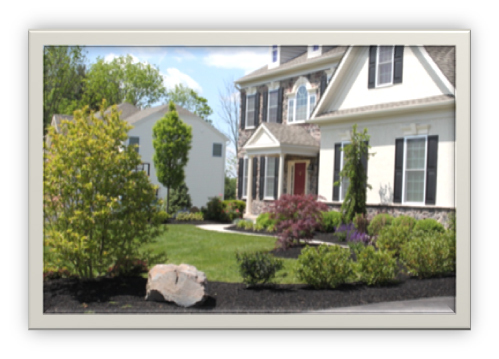 Contact R&R Caddick 215-491-0767 to beautify your front yard today.